I would say of all the different kinds of cuisine we eat (Mexican, Chinese, Thai, Indian, American, etc.) I am the most clueless when it comes to Chinese/Japanese food. I can never quite capture the flavors I like, and I'm a miserable failure when it comes to stir fry. That is, until now! 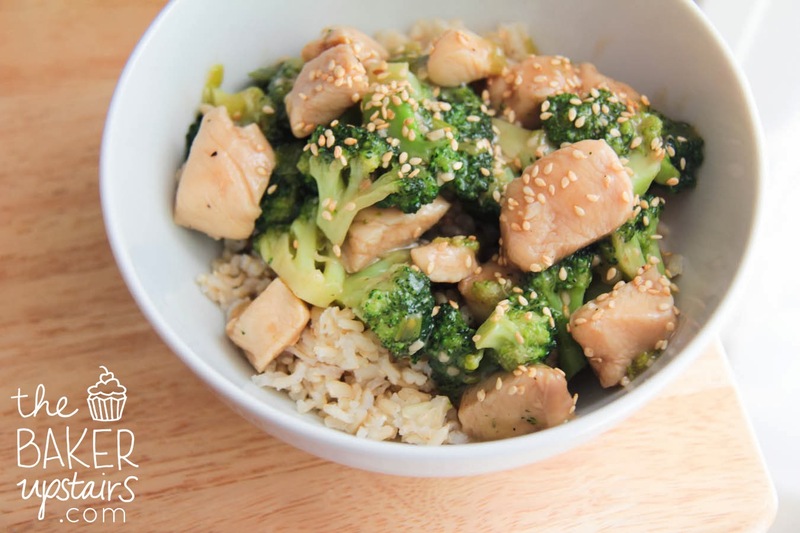 This chicken and broccoli was every bit as delicious as what they serve at my favorite Chinese restaurant, and was easy and quick as well. I left out the hoisin because I didn't have it, and it was still fantastic. I served it over my favorite baked brown rice, and it was a great pairing. So fresh and healthy and wonderful! In a medium bowl, toss the chicken with the scallion whites, about half the garlic and ginger, the soy sauce, sugar, 1 teaspoon of the cornstarch, 1 teaspoon of the salt, and the sesame oil. Marinate at room temperature for 15 minutes. Mix the remaining cornstarch with 1/3 cup water. Heat a large nonstick skillet over high heat. Add 1 tablespoon of the oil and heat. Add the broccoli and stir-fry for 30 seconds. Then add the remaining garlic, ginger, 2 tablespoons of water, and season with 1/4 teaspoon salt, and pepper. Stir-fry until the broccoli is bright green but still crisp, about 2 minutes. Transfer to a plate. Get the skillet good and hot again, and then heat 2 more tablespoons oil. Add the chicken and chili flakes if using. Stir-fry until the chicken loses its raw color and gets browned, about 3-4 minutes. Add the hoisin sauce, return the broccoli to the pan and toss to heat through. Stir in the reserved cornstarch mixture and bring to a boil to thicken. Add more water if need to thin the sauce, if necessary. Taste and season with salt and pepper, if you like. Mound the stir-fry on a serving platter or divide among 4 plates and garnish with sesame seeds; serve with rice. And I just bought the ingredients to try this too!!! Thanks!